Joshua Lau and Nora Wu win in Hart House Spring Junior Open! Hart House Chess Club hosted its Spring Junior Open tournament from March 16th to March 17th, 2019. It was the second junior chess event organized by our club in two consecutive years and what a blast it was! Held in the elegant Debates Room with the arched ceiling, the event attracted 22 young participants who showed everyone their confidence and chess skills during the March break. Divided into two rating sections, an U- 900 and an U-1300 section, with 11 players each, the tournament offered 5 rounds of classical chess (55′ + 5”/move) in swiss-system. The competition was remarkably intense, as can be demonstrated by the ties for the top 3 in each section. In the upper section especially, with one round to go, there was a long list of players from which the winner could have come out! Joshua Lau and Mark Rozin were leading with 3 out of 4 points but Yinan Wang, Ivan Huang and Zi Liu were a hair’s breath away from the top with 2.5 points in 4 games. In the critical round-5 game, Zi Liu (white) faced Joshua Lau (black)! 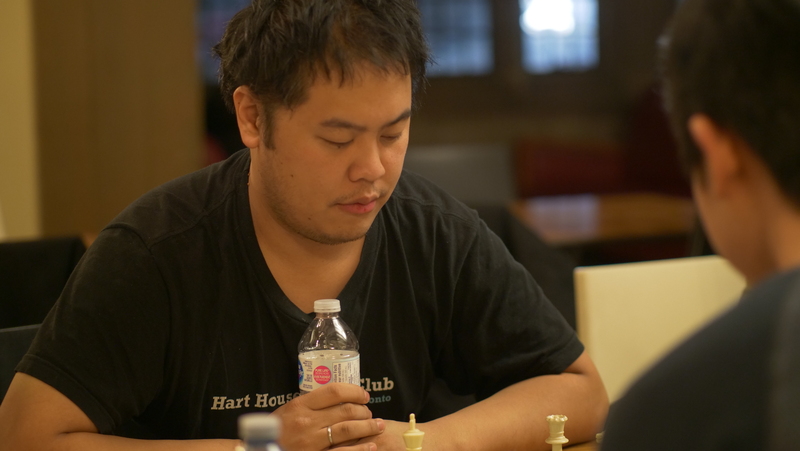 In the last-round games, Ivan Huang managed to beat Mark Rozin, Zi Liu lost to Joshua Lau and Yinan Wang defeated Justin Huang. This meant that Joshua Lau was sole first with 4/5, followed by Ivan Huang and Yinan Wang with 3.5/5 each. As the latter two had drawn their head-to-head game, the second tie-breaking criterion (opponent’s average rating) was decisive with Ivan Huang emerging on second place and the silver medal position! Lily Liu was also in a medal-winning position as she was the top girl in her section! A light chuckle by Joshua Lau a few moments before winning the top place in the U-1300 section! It’s also worth mentioning that the last round saw the best game of the U-1300, a spectacular victory by Sven Coat against Varun Pillai in the venomous Italian. After sacrificing two pawns Sven gained enough time in the opening to launch an unstoppable attack against his opponent’s king, checkmating him in the middle of the board. Sven Coat did not manage to place among the top three this time but his spectacular last-round victory was jaw-dropping! In the U-900 section things looked a bit clearer at the top level. Nora Wu entered the last round with 4 out of 4, threatened only by Karma Pillai and Yiming Zhao who had 3 out of 4 each. Gordon Zeng and Charis Zhu were also fighting for medals, with 2.5 points each. After a double-edged game with opportunities for both sides, Nora Wu managed to win her game against Karma Pillai, scoring a perfect 5 out of 5 score and clinching the gold medal position! Charis Zhu and Gordon Zeng also won their games against Yiming Zhao and William Johnson, respectively, so they tied for second place with 3.5 points out of 5. Curiously enough, in a mirror image of the upper section, Charis and Gordon had drawn their head-to-head game so the second tie-breaking criterion had to be used, which placed Charis Zhu second and Gordon Zeng third. As for the top-female player distinction, the shiny medal was awarded to the very resilient Katelyn Johnson. A formidable 5 out of 5 performance gave Nora Wu a very deserved first place! As for the best game of the U-900 section, Jasper He and Charis Zhu must be very proud of their battle on Round 4. Their moves led to a slow and extremely positional game with opposite castles, where each side was fighting for the control of the center and the fast pawn expansion on the wing where the opposite king was. You don’t often see great strategic games like this between younger players. Aided by the very good play of Jasper He, eight year-old Charis Zhu played the best game of the U-900 Section on Round 4. The event organizers were delighted to introduce for the first time 11 beautiful digital boards in the competition, allowing the spectators to watch all the games live on-line! But March madness did not end with the live broadcasting of the games! With five national masters analyzing the games with the kids after each round, the excitement that swirled around the skittles room added even more to the enthusiasm of the day! A nice buffet of snacks and coffee was provided to the kids and the parents and a bulletin with the games of the tournament was sent out to all the participants for further review and analysis! Alex Ferreira joined Weiwen Leung as one of the two tournament arbiters! Of course, none of this could have happened without the very generous support of the UofT students, who volunteered a lot of their time and energy to boost the event. Weiwen Leung and Alex Ferreira were the event arbiters and did an excellent job running the pairings and providing the results, standings and tie-breaking criteria. The latter also took on the difficult task of the on-line registrations. Jimmy Bartha deserves some really high praise as he served as digital board operator in this first exciting trial! He was also the person who, with the aid of Sean Lei, Dmitry Choukov, Andrew MacMillan and Panayoti Tsialas, set-up the cables and the boards in the playing hall. Alyssa Rusonik, the incoming Communications Director of the club, was, once again, very efficient and exquisite in the handling of the on-site payments. Her ability to demonstrate leadership skills in every task she undertakes is outstanding. National Master Tanner McNamara (here with William Johnson and Yiming Zhao) had a great time analyzing the kids’ games in the skittles room! The club incurred a huge debt to Zara Toyserkani, who was at the skittles room from the very first till the very last minute of the tournament, taking care of the buffet and making sure that the parents and the kids would have a great time throughout their time at Hart House. Of course a big shout-out goes out to National Masters Sean Lei, Tanner McNamara, Jonathan Yu and Zane Nasir and to ex-Varsity player Gary Huang, who labored really hard in the skittles room, analyzing the games of the kids, providing helpful chess instruction and encouraging them to improve game by game! The combination UofT students analyzing chess games with the kids in the skittles room was and remains the most popular feature of our junior tournaments! The award ceremony was led by the very talented incoming club treasurer Sean Lei, who was delighted to congratulate the winners in each section! Finally, the tournament was directed by Panayoti Tsialas, whom the club would also like to thank for making the photo gallery and the bulletin of the games. Snapping a pic of tournament director Panayoti Tsialas is not the easiest mission but Zara Toyserkani managed to get the shot! It’s been a great pleasure for our club to organize its second Junior Tournament in two years. We are grateful to Hart House for providing us with all the assistance we need to run the event and, more than anyone else, we wish to thank all the participants and their parents for taking part in our tournament and supporting the official chess club of the students of UofT. See you all in our next event! Until then, practice, play analyze, repeat! Quadruple Tie in the 2019 Hart House Reading Week Open! The 2019 Hart House Reading Week Open took place in Toronto, Ontario, from February 16th to February 18th. It’s been roughly a decade since the first very successful Reading Week Open and this year’s was no less exciting! A remarkable 188 participants from various chess clubs in Ontario and Quebec came out to play and fought for the big prize pool, totaling $7,400. As per tradition, participants were split into six different sections, based on rating, and the started! In this Swiss-style tournament of classical chess, the top three winners in each section would be determined after six competitive rounds. There were plenty of talented participants in the tournament and, among them, four International Masters who joined the Crown Section, to the delight of the many spectators. In the last round of the tournament IM Nikolay Noritsyn faced IM Tomas Krnan in a highly asymmetrical endgame, which ended in a draw! Four very worthy contenders tied for first place in the Crown Section with 4.5 points out of 6 games (22 participants): IM Nikolay Noritsyn, FM Rohan Talukdar, FM Kenta Olivier Chiku-Ratte and CM Nameer Issani. It was a very pleasant surprise from Issani, who started on position 20th in the initial rank (FIDE 1952) and slowly climbed up to the top. 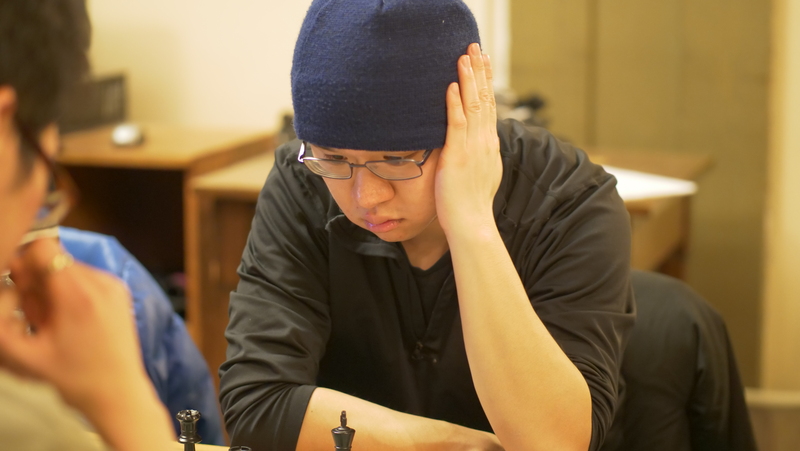 In the Under 2200 Section (27 participants) Brian Jiang was in great shape, scoring an almost perfect 5.5 points out of 6 games. Eric Ning and Henry Liu also had a wonderful tournament, scoring 5 out of 6 and sharing second place. In the Under 1900 Section (52 participants) Ibrahim Syed Ahmed was the undisputed winner with a formidable 5.5 out of 6 games. There followed a tie between 7 (seven!) players for the silver medal position: Matthew Bergeron, Jordi Profits Fortuny, Trfelino Miaco, Joseph Liao, Dennis Tran, Boris Iriarte and Seiji Nakagawa. Hart House Chess Club’s Jack Moore was, once again, on the top 3 of the U1600 section. In the Under 1600 Section (37 participants) Johannes Kirk Dickson finished the tournament undefeated with 5.5 out of 6 points and deservedly became the section winner. Hart House’s own Jonathan Moore also had a great tournament, scoring 5 out 6 and clinching second place. There followed, at a very close distance, Gary Hua, with 4.5 out of 6, winning third place. In the Under 1300 Section (35 participants) Sophia Wang and Ivan John Deal Torre were the co-winners, as each dropped only one point in six rounds. Christopher Charles, Lefan Yang and our very own Ethan Moon also had a very good performance, scoring of 4.5 out of 6 and sharing the bronze-medal position. Finally, in the Under 1000 Section (15 participants) Noah Velasquez had a great tournament and won the section with 5 points out of 6 games. There followed, just one point behind him, UofT student Iudin Fraim and CCYC’s Lily Liu, sharing second place. 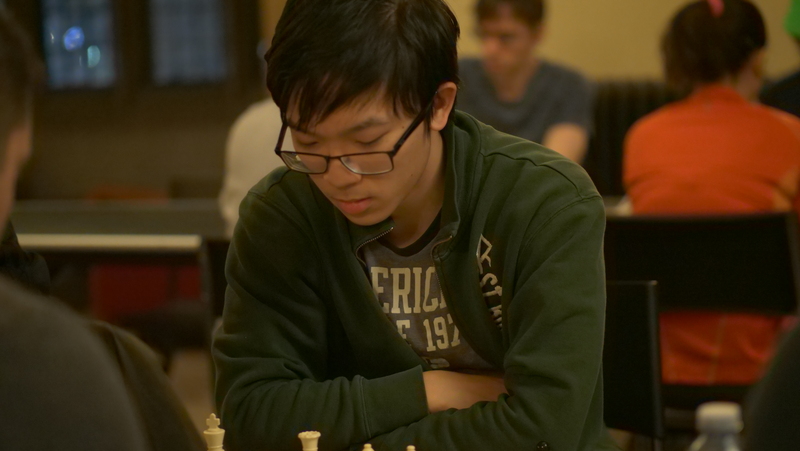 A very honorable mention goes out to Steven Shi, who just arrived in Canada and, in his very first tournament ever, he scored a breathtaking 6 out 6. Steven Shi scored an impressive and deserved 6 out 6 in the U-1000 Section! Hart House Chess Club would like to publicly thank a number individuals for their precious assistance towards organizing this event. As always, most of the credit goes out to the Director and Chief Arbiter of the tournament, the amazing Alex Ferreira. The tireless Portuguese is not only the person who first envisioned and gave life to this open tournament several years ago, but he is the one who has kept it going for about one decade, breathing new life to it over the course of the years! Hart House Chess Club is delighted and honored to be supported by one of Ontario’s and Canada’s most successful chess organizers. Next we would like to recognize the indispensable assistance of Tyler Longo, the Deputy Chief-arbiter who, once again did a fast and very professional job entering the results of 6 rounds and running the pairings for more than 185 players in 6 simultaneous sub-sections. Alyssa Rusonik, performed exquisitely the hard task of receiving on-site payments by dozens of participants and impressed us all with the level of her commitment and her remarkable work ethic. 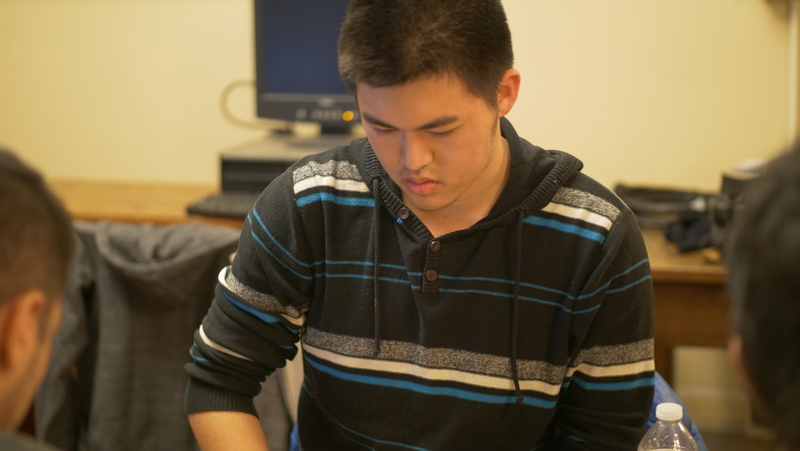 Ben Hahn, Hart House Chess Club’s Alumni Chair, took on the demanding mission of doing the financial accounting of the tournament, making sure that everything had been kept in order, once the event was over. For yet another tournament, Andrew McMillan’s silent but manifold contributions cannot be emphasized enough: behind the well-functioning chess equipment, the clean tables, the unstained chess boards, the uncreased scoresheets there lied Andrew’s helping hand. Sahan Karunaratne, the club’s Event Coordinator, was on the playing site from the very start to the very end of the tournament, contributing tirelessly in all sorts of ways: from doing on-site registrations and setting-up the play hall – including the water station and the skittles room – to being a floater in certain sections with odd number of players and taking down all the equipment at the end of the tournament. Finally, aided by Sahan, Panayoti Tsialas, the club fundraiser, created the nice photo gallery of the tournament and made himself available for answering any general inquiries that the participants and spectators might have. On top of these volunteers, we would like to thank University of Toronto as well as Hart House for their steady support to our chess initiatives, including our Reading Week Open tournament. The Hart House Information Hub, the Meetings and Events Office, the Staging Personnel, the Department of Communications as well as the Financial Accounting Office coordinated their efforts amazingly to help us in our event. We wish to kindly acknowledge their assistance. We also incurred a big debt to Annex Chess Club, which generously lent us 15 of their digital chess clocks. Finally, the most heartfelt “thank you” goes out to the 188 people, who defied the freezing cold and came out to play in the tournament as well as to their parents and friends who attended the event as spectators. We are very thankful for your participation and we are looking forward to seeing you again in our upcoming Hart House Spring Junior Open in mid-March! 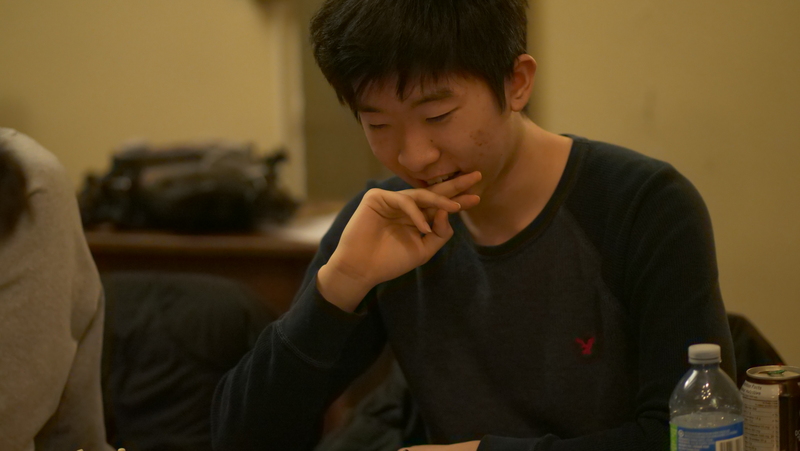 William Li wins Hart House’s Fischer Random Tournament! Fischer chess (Chess 960), invented by Bobby Fischer is a variant of chess designed to remove any opening theory advantages. The tournament like all 960 games was very frustrating for the seasoned club player who can talk at length on a number of opening lines. Featuring the very strange sight of extensive thinking on the very first move, the tournament was a challenge even for the most seasoned players. As the games progressed into bizarre middlegames with multiple pieces lying on awkward squares, the players found themselves straining past their normal strategic thinking to unlock their forces. Numerous upsets occured as players were caught in the swirl of a game that was both familiar to and starkly different to the game that they loved. This was particularly true for the endgame which should have been the most familiar, but instead wound up being a complicated mess with no side being familiar at all with the position that was presented. The decisive last-round match between William Li and Leslie Tang ended in a 1-1 tie! In terms of individual results, William Li demonstrated a cool calculating mind, avoiding the usual pitfalls and blunders that are encouraged by such a challenging variant. Constantly placed on the first board, Li was able to demonstrate a competency that resulted in no match losses. Comfortably cruising with 8 points total, he dominated the field to receive first place. 8 out of 10 and first place without any defeats for William Li! 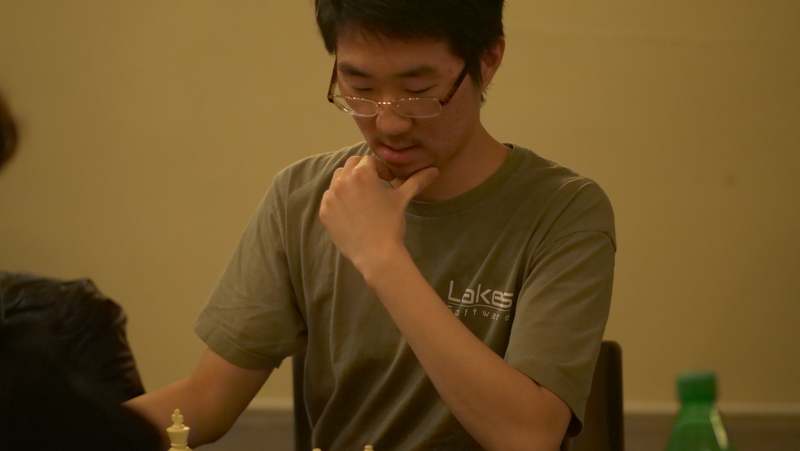 In second place was Edward Chan with 6.5 points, a veteran at the club he demonstrated keen positional understanding. Edward Chan’s solid tactical play gave him the deserved second place! Third place was won by Kevin Li with 6 points who once again reinforced his honorary title as “mini-stockfish”. Kevin Li scored 6 out of 10 and finished in the bronze-medal position! An honorable mention should go to Leslie Tang, our president who in his role as a floater racked up 7 points. Further, a big shout out goes out to Panayioti Tsialas, who was the tournament arbiter but also the photographer for the event and thus ensured the tournament ran smoothly and could be an enjoyable experience. Finally, we would like to thank all the participants who defied the cold weather and came out to play in the tournament! We are looking forward to seeing you all again in our upcoming events too! Join the Weekly Seminars on Chess Strategy! This is a more rigorous workshop, targeted at advanced chess players, ranging from 1300 to 1700 CFC rating. Some prior experience and time commitment is required of the participants. This semester’s lessons will focus on chess strategy with special emphasis on how the pieces normally develop during a game, in order to reach their full potential. The Workshop will run every Friday, from January 25th until March 29th, 6-7 PM, and the lessons will be taking place at the Hart House Reading Room. National Master and ex-Varsity player Jonathan Yu is the instructor in this workshop. #5 Feb. 22nd: Rooks: Open Files & Ranks – Which Rook to Move or to Trade? #6 Mar. 1st: Pawn Structure: Weak Pawns, Passed Pawns, etc. #7 Mar. 8th: Space: Are we Alone in the Universe? #9 Mar. 22nd: Material: To Take or not to Take? Teaching material and certain ideas will be taken from Jeremy Silman’s, How to Reassess Your Chess: Chess Mastery Through Chess Imbalances but the tentative Syllabus is, in great part, the original creation of the Instructor. Silman’s book can be found at HHCC’s lending library. No reading is expected before class but attendees will be assigned optional homework to practice at home. *A student membership costs only $25 and it is valid for the entire year. Join the Weekly Lessons on Chess Tactics! Starting on Friday, February 15th, Hart House Chess Club will be running a series of workshops on chess tactics directed mainly towards Upper Beginner and Intermediate chess players. These lessons will be taught by ex-Varsity Chess player, Panayoti Tsialas, and everybody is welcome to attend! The seminar is recommended for chess enthusiasts who have learnt the movements of the pieces and the rudiments of chess and wish to step-up their game and reach a rating of around 1000-1300. #1 Feb. 15th: Attack and Defense: What are Chess Tactics? Teaching material and ideas will be taken from Learning Chess (Steps 1, 2 and 3), by Rob Brunia and For van Wijgerden. No reading is expected before class but attendees will be assigned optional homework to practice at home. University of Toronto reclaims the crown in the 2019 Canadian University Chess Champion! Just several days have passed since the closing of the Canadian University Chess Championship. It was a riveting competition that took place in McMaster University this year. Twenty-three teams of chess players competed in two divisions: the Championship League and the Reserves section. Both sections had intense competition. Our club sent in four teams in an attempt to claim victory to both sections and show everyone what U of T students are! University of Toronto A and B competed in the upper section, whereas University of Toronto C and D played in the Reserves Division (< CFC 1800). It is with honor, that the Hart House Chess Club may exclaim that we have brought home the Grand Cup! Of course, the road to success was full of challenges as there were another five teams fighting for the big trophy. Our University of Toronto Team A consisted of Mark Plotkin, Qiyu Zhou, Joseph Bellissimo, James Fu and Zehn Nasir averaging CFC 2293. However, it was the defending champions, Waterloo University, who were the top seeds of the tournament with an average rating of 2364. There followed, at a very close distance, the very capable teams of Ottawa University (2266), Western University (2002), McGill University (1936) and University of Toronto B (1804). University of Toronto A smiling at the camera! But let’s start from the beginning. The games took place January 12 to 13 at the elegant Convocation Hall of McMaster University and 23 teams took part in the tournament (6 played in the upper section and 17 competed in the lower division). Unfortunately, Ontario was once again over-represented, with 22 teams coming from this province and only one team coming from Quebec, while the Western Provinces were not able to participate. Hopefully, this imbalance will be adequately addressed in the future. The games were hosted at McMaster University’s biggest and most beautiful Hall! After the first two rounds of the tournament, University of Toronto A and Western University A were the only teams with 2 match points. Both of them had beaten McGill but, while UofT had won a convincing match against the mighty Ottawa University, Western impressed even more by beating the mightier (at least in rating) Waterloo University. In Round 3 Western University faced the rival University of Toronto A. The Round-3 battle between Waterloo’s and Ottawa’s A Teams has just begun! In the other important match of the third round, Waterloo University suffered a second defeat by Ottawa’s Team A, which managed to climb up to 2 match points, just half a point behind Western A and UofT A. It was now UofT’s turn to prove that they could take the heat of a match against the defending champions, who really needed a victory to make their big comeback. The critical Round-4 game between the defending Champions and our own UofT A has started. This critical match started out rather quietly but it quickly became extremely suspenseful. It seemed that UofT had built a small edge over the course of the match but that advantage was not converted into solid full game-points. To the contrary, things became quite rough for UofT when Boards 2, 3 and 4 drew their games, leaving Mark Plotkin fight against International Master Michael Song in a very challenging endgame. The fate of UofT’s match against Waterloo was placed in the experienced hands of the Team Captain, FM Mark Plotkin. The position was extremely asymmetrical in terms of material: Michael Song had a Queen, whereas Mark Plotkin had two somewhat uncoordinated minor pieces, three pawns and a fairly exposed King. Could Mark hold the draw against a stronger opponent? The answer is, he did! He defended brilliantly and he scored a draw, amid a big crowd of spectators who were holding their breaths throughout the endgame! This match proved that chess can, indeed, be an impressive game full of strong emotions and excitement. This one truly was an exciting moment! In last year’s match against Waterloo, Mark played Zi Yi Quin on board 2 and, due to an unfortunate miscalculation, his advantage evaporated and he even lost his game, allowing Waterloo to tie the match 2-2 and win the tournament. This time, however, it was the other way around! A swarm of enthralled spectators are watching the last and most exciting game of Round 4! But the tournament was far from over yet as both Western and Ottawa duly won their respective matches against UofT B and McGill. This meant that Western entered the last round of the tournament as the sole leader with 3.5 out of 4 match points, while Ottawa and UofT A were tied for second place with 3 out of 4 and within striking distance. In Round 4, University of Toronto B fought to the best of its abilities, but in the end, Western’s A team proved too strong and won the match convincingly. Thus, everything would be decided in the 5th and last round of the tournament. UofT A defeated UofT B with relative comfort and finished the tournament with 4 out of 5. But the final ranking turned on the result in the match between Western and Ottawa, the other two big rivals for the medals. In the end, the match was a draw, which meant that University of Ottawa was third with 3.5 out of 5. Amazing performance, 4 out of 5 match points and silver-medal position for Western University A! As for the big winner of the tournament, the tie-breaking criteria provided the unequivocal answer: University of Toronto was the 2019 Canadian Universities Chess Champion!! A (litteral) taste of victory? For a third time in a row, Toronto’s A team went undefeated with a score of 4.0/5.0! Formidable performances warrant warm congratulations to each and every one of our great players. Joseph Bellissimo played on the third board of UofT’s A Team! However, a special shoutout is called for for the Team Captain who, not only held the draw in the most critical match against Waterloo, but also contributed 4.5 points in 5 games! FM Mark Plotkin: His 4.5/5 points were a major contribution to the Team’s success. It was an extremely close tournament and, in the end, it was thanks to the tiebreakers that our team managed to pull ahead and reclaim the most precious trophy in Canadian University Chess! James Fu, who has represented UofT in all the major 2018-19 tournaments, shared board four with Zen Nasir. Quite naturally, things were a bit harder for University of Toronto B, as they were the underdog team of the upper division based on their starting rating (Avg. Rtng: 1804). However, the players enjoyed their matches and used this opportunity to compete at the highest level and gain as much experience as they could for the future. In fact, some of them managed to get some rating points! Tanner McNamara was the Captain of UofT’s B Team. It’s been a very active chess year for Tanner! A most delightful surprise, which is worth noting, was the presence of the Club Secretary, Leslie Tang (CFC 1756), on Team B! Leslie played on board 4 of the team providing a lot of inspiration as well as encouragement to the Team! This was the first time that Mahip Singh represented UofT in a chess competition, since he joined the club in December 2018. He gained 59 rating points! Finally, an honorable mention is owed to Jurgen Aliaj (CFC 1570), who bravely joined a Division 1 team as an alternate and even managed to score a draw against a stronger opponent winning some rating points! Jurgen Aliaj, currently captaining the UofT’s Student Team in the Greater Toronto Chess League, has demonstrated rapid progress in his chess skills! But the fun does not stop at the upper division, of course! In the reserves section two of our teams competed really hard to bring back a second big award to the club! University of Toronto C included Jimmy Bartha, Sahan Karunaratne, Jonathan Moore and Alyssa Rusonik, who averaged a solid CFC 1454! UofT C boasted not one but two Club Execs among its ranks! These players put up a really hard fight to help UofT achieve the double triumph but, in the end, the victory went to the truly deserving Team A of Queens University, who scored a breathtaking 5 match points out of 5 matches. With 4 out of 5 match points, Ryerson University’s Team A clinched second place and a silver-medal position! Following Queens’ perfect team score, the second place went to Ryerson University’s Team A with 4/5 and the bronze-medal position was won by Western University’s team B with 3.5/5 (Western saw its teams win an award in both divisions, even though on neither of the two occasions was it the gold medal). Alyssa Rusonik (CFC 1305), a new member of Hart House Chess Club and one of the few women in the CUCC, played on board 4 of Team C! Finally, University of Toronto D consisted of Henry Vu, BenJohn Libardo, Blake Jones and Jeremy Downey, who joined the competition, looking to gain more chess experience! Led by freshman Henry Vu, University of Toronto D took advantage of the opportunity to participate in the 2019 CUCC and gain considerable experience from the competition! 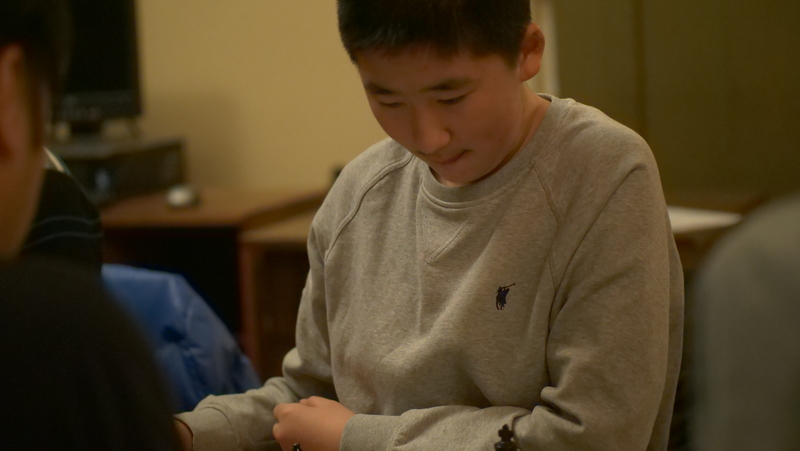 For some of them, it was their first-ever chess tournament! Thus, it is to be hoped that this competition will serve as the beginning of an even more exciting journey in chess and that it will only enhance their appetite for more games and further improvement! Jonathan Moore played on the third board of UofT’s Team C! He’s clearly one of the most active UofT players! Our club is ecstatic to thank each and every player who competed on behalf of the club. There were many impressive games from our members that made us really proud. Hart House Chess Club defines winning as the enjoyment and satisfaction of competing in a tournament. Awards such as trophies and the alike may be fantastic but our greatest pride is to say that the all of our players have won something from the tournament. Jimmy Bartha was another Club exec who delightfully took part in the tournament. For Jimmy, this must me the fourth CUCC! With that said, a special thanks is owed to Sahan Karunaratne, the External Events Coordinator of our club, who was the chief organizer of the logistics regarding UofT’s participation, including the trip, the registration and the accommodation of 20 people! His job was excellent. Sahan Karunaratne, the Events Coordinator of the Club, was once again the key person in organizing UofT’s 20-person delegation. His devotion to the club is worthy of high praise. A special shout-out goes out to FM/WGM Qiyu Zhou and her mother Penny Zhou. 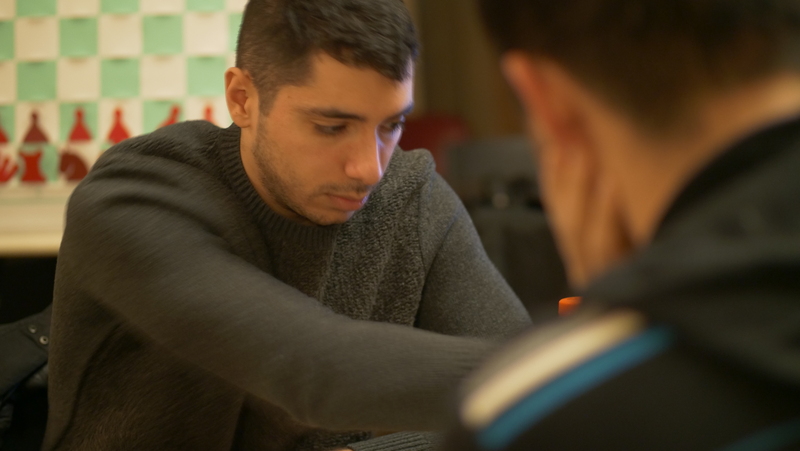 The former, played on board 2 of UofT’s Team A and wrote a beautiful blog post about the 2019 CUCC on chessbase.com which can be accessed here (it is a really good read coupled with a few annotated games as well as insights from within the tournament so we highly recommend it). The latter, covered the entire event for the popular Facebook page “Chess Tournaments in Canada” and provided most of the photos that we included in the present article. Finally, Hart House Chess Club would like to thank the organizers of the tournament for all their hard work. Especially McMaster Chess Club’s Co-Presidents Alvin Leenus and Andrew Leber handled all the logistical pre-tournament questions very professionally. Of course, they were not alone in this. A team of tireless volunteers, including Selvin Leenus, Jacob Cianci, Harold Hunter, Kyrie Xu, Nikhil Patel and Vincent Hou contributed to the great success of the tournament. Given their devotion, it is small surprise that every complication that occurred during the tournament was dealt with swiftly and efficiently. The hosts of the 2019 CUCC, McMaster University, worked as a team and did a wonderful job organizing the games! The bar is now set very high for future organizers and we are already looking forward to next year’s CUCC, which will be hosted by Laurier University! Until then, the precious Queen’s Cup for chess will be safely kept in the display case of University of Toronto’s Hart House! University of Toronto wins top International Team Award in the 2018 PanAms! The Pan-American Intercollegiate Team Chess Championship, the crown jewel of college chess in the USA, is historically played in the days between the Christmas and New Year’s holidays, December 27th to 30th. The competition is open to chess teams from post-secondary schools in North America, Central America, South America, and the Caribbean. This year’s Pan-Am featured 230 players competing on 53 teams, a slight decrease from last year’s 58 teams. Each Pan-Am team had four players (called “four boards”) and up to two alternates. At the end of six rounds in San Francisco, four of the U.S. schools qualified for the President’s Cup, to be held April 6th-7th, 2019, at the Marshall Chess Club in New York City: Webster University – the winner of the 2018 PanAms – The University of Texas at Dallas, The University of Texas Rio Grande Valley and – surprise surprise! – Harvard University! University of Toronto was represented by our Varsity Chess Team, including Joseph Bellissimo, James Fu, Tanner McNamara and Gary Huang (Average Rating: 2184). The team managed to score 2.5 match points in 6 rounds, winning the distinction of the top International Team of the Tournament! 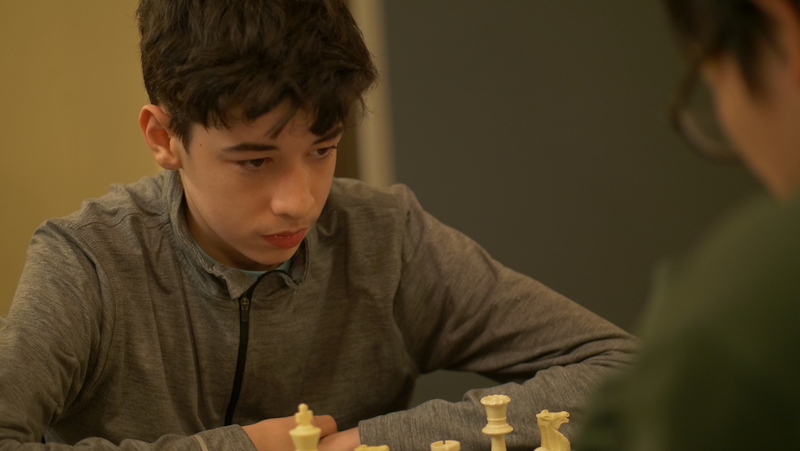 At an individual level, Joseph Bellissimo, the top board of the team, impressed everyone by scoring a splendid 5/6, not losing a single game, and therefore becoming the second best performer of the entire tournament on Board 1. Team Captain and experienced PanAm player, Tanner McNamara, has the report from the games! 53 Teams competed in the 2018 PanAms and, as you can see, the playing hall was very accommodating! First off, I can’t write anything about this trip without saying a big thank you to Hart House, the chess club, all the executives, and everyone who helped and supported us from the qualifier through the event. It’s a huge honour to represent the University of Toronto at such a special event as Pan Ams. As for the trip itself, things got off to a fun start when we had to move hotel rooms on the first day because the temperature was stuck at 24.5°C. But we did move rooms, we got more comfortable, and the tournament started well with a convincing victory over the University of Utah. Regarding the venue, it was easy to tell we weren’t in San Francisco proper. Sure, the weather was beautiful and we had some nice views of the bay. But going out to look for food, we quickly discovered that Subway, by virtue of being basically the only restaurant not to close between lunch and dinner, would be our lunch spot every single day. Of course it didn’t help that Joseph is addicted to Subway, and then he started playing well and we couldn’t break his routine. And dinner would have to be in the hotel, because the night games ended after every restaurant closed. Seriously, you can’t even get late night pizza in Burlingame. 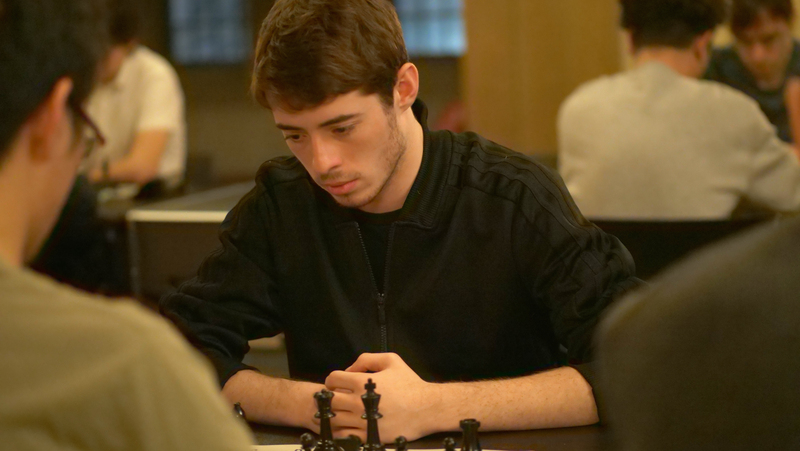 Joe Bellissimo has been coming to Hart House Chess Club since he was around 11 years old! As a first-year student, now, he displayed amazing skill scoring 5 out of 6 on Board 1! The chess got much tougher starting in round 2. We played reasonably well, but lost to a strong UMBC team 3-1. I grew up 15 minutes from UMBC, and I started playing chess the same year they won their first (of six!) Final Four. Growing up so close to the college chess scene, it was a dream come true when I was able to compete in Pan Ams for the first time. But that was actually in 2014, for Carleton College. We had a great event, winning top small school and picking up top team upset for our win over NYU. We had a tough round four, though, paired against University of Toronto. I lost to an on-fire Nikita Gusev (who scored 5.5/6!). Four years later, now I’m in grad school at UofT, and I feel so lucky to have gotten the opportunity to go back to Pan Ams, now representing this school with such chess history, culture, and support. It’s the second PanAm competition for Jonathon Singler, Captain of the Alaska Pacific University. The entire team once again wore their lumberjack uniforms with the eye-catching furs! Getting back to the chess, we had an easier matchup on paper against Ohio State in round 3, but we only barely managed to squeak by with a 2.5-1.5 victory. At times we were in danger of doing worse, but a win is a win, and this set us up for another tough matchup in the next round with the D team from University of Texas Dallas. Despite being a D team, they outrated us by a healthy margin on every board, and we ultimately lost 3-1. In the fifth round we ended up in the top half of our score group again, and we were rewarded with another matchup favourable on paper against the C team from Arizona State. We just didn’t play well enough to win. After getting three good positions, we spoiled two of them and had to sweat out a saving swindle from Joseph on board one. But, as always in this event, he was up to the challenge. Although we couldn’t win the match, we pulled ahead of our international competition from Mexico with this draw. With tied matches being uncommon in team competitions, we actually ended up underdogs in our final round against UCLA. For the first time, I saw my preparation still on the board after move three (this time to move 13! ), but I rather quickly and recklessly spoiled what was a good position. We put up a decent fight but fell by a wide margin in the end. It must be noted that Joseph went into the final round with a chance for individual gold on board one. His hopes were dashed when Illia Nyzhnyk won for Webster-A, but a draw put him on 5/6 and in second place on board one. Mexico lost in the last round, and we clinched Top International, meeting one of our goals for the event. We also thought before the start that we should have good chances to win our 2000-2199 rating division. At the awards ceremony, though, we saw a deserving Michigan team walk away with that hardware. Cheese! Some familiar faces from Michigan University won the award for the 2000-2199 rating division! Another participant from the Ivy League Challenge, Harvard, went home with an even bigger prize – a trip to the Final Four in April courtesy of their fourth place finishing following a last round win over SLU-B. It was cool to see them do well, leaving two of the big schools – SLU and Texas Tech – on the outside looking in. Joining Harvard at the Final Four will be Pan Am winners Webster, UTD, and reigning champions UTRGV. 4th Place and qualification to the President’s Cup for Harvard University, the only non-chess-scholarship University to score such an achievement! Personally, I failed to meet my standard of chess playing. I played a good warm up event earlier in December at the Hart House Holiday Open, picking up about 30 CFC rating points. I felt good going into Pan Ams, and then I promptly donated about 30 USCF rating points. Despite personal frustrations over the board, it was a fun event, and we stayed upbeat as we had our chances as a team, with the division and top international prizes still in play heading into the last round. Joseph, James, and Gary, thank you all for being such great teammates. I hope you had as much fun as I did.